Originally all four-in-hand neckties were cut from a single large square of silk, which was folded over 7 times to give it body and fullness. Only a few ties are made in this way today, because of the high cost of silk and the absence of many remaining artisans. However, every finely made necktie is still cut on the bias, to assure that it falls straight after being tied, without curling to a side. All ties, except 7 fold neckties, are lined. There are many myths about the linings inside a fine necktie. It is not true that the cost of the lining is indicated by the number of gold stripes on the inner fabric. Nor is it true that a heavy lining is better than a thin one. 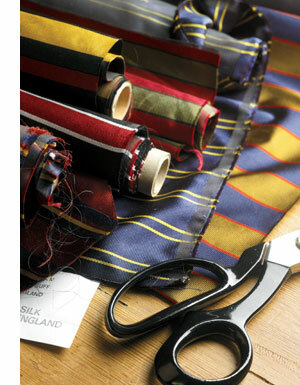 The object of the lining is to provide the proper weight for the tie, so that it knots perfectly. With some silk, a heavier lining is needed to accomplish this; with other silks, it is quite the opposite. In fact, sometimes makers of lesser ties will attempt to pass them off as quality materials by adding a thick lining, as an uneducated consumer might think the thickness of the tie indicates the quality of the outer silk. Fine linings today are made of wool, whose weight is denoted by gold bars. Fine neckwear is entirely handmade. The cutting, the sewing and the finishing are all done by hand and an artisan can stitch no more than ten in an hour, while the entire tie takes at least a day to complete. Most neckwear sold today is made entirely by machine. Much neckwear that is called "handmade" is finished by hand, but otherwise made on a machine. These ties are produced in volumes of several thousand daily. Does handmade matter? Yes, it does. Handmade is better with all clothing -seams have more elasticity, draping is better, fabric is handled with more care in the process and subject to less abuse, and more hands examine and provide quality control. Yet, in most garments, the cost of the labor for hand crafting has become very high, and absent the understanding of the difference in quality, many men are unwilling or unable to pay for the better garment. A necktie is one of the only garments that remains affordable when entirely handmade. This is not to say that makers of machine made ties will not charge as much! They too recognize that the price still seems reasonable. Furthermore, there is active marketing of "designer" neckties today, whose price is rationalized by its label, and yet the quality is rarely considered. A fine necktie should be cut on the bias, into 3 pieces to include the back, the front, and the neck, allowing it to conform to your neck; it should have a stitch joining the two sides on the back, called a bar tack, and applied by hand. It should have a slip-stitch, whose end, knotted, can be found loose under the bar tacked area. This stitch gives resilience to the tie and assures that it will fall out to return to its original shape when hung in your closet. A fine necktie should have a silk tip on its reverse, which both hides the lining and keeps the tips of the lining in place, and a "keeper" sewn into the seams of the back to hold the back of the tie. A higher priced necktie should have a keeper separate from the label, and it should be self-tipping, meaning the tip should form from the same cloth as the front of the necktie. A fine necktie should be cut in a shape and lined so as to produce a perfect dimpled knot - one that can be tied fast to the collar without lifting the shirt collar from the chest. Most important, a fine necktie is cut from the finest materials - generally pure English or Italian silk, but occasionally Scottish cashmere or wool, or Irish linen. The quality of materials from the finest mills of those countries surpasses even the natural fibers from mills of other countries by a country mile. When you purchase a fine tie, feel its "hand" for the luxuriousness of the fabric. Like Justice Potter Stewart, you will know it when you see it!